A fellowship programme which aims to develop a network of nurses with expertise in older people’s care has had its immediate future guaranteed. Health Education England (HEE) has agreed to fund the Older Person's Nurse Fellowship course at King’s College London for at least two years. Course organisers and nurse lecturers heard the news at the Older Person's Nurse Fellowship conference on Tuesday where specialists in older people’s care gathered to hear from the inaugural 2014-15 cohort. Quality improvement projects highlighted included transferring patients from hospitals to care homes in Gateshead, and encouraging more community patients in London to self-manage their conditions. 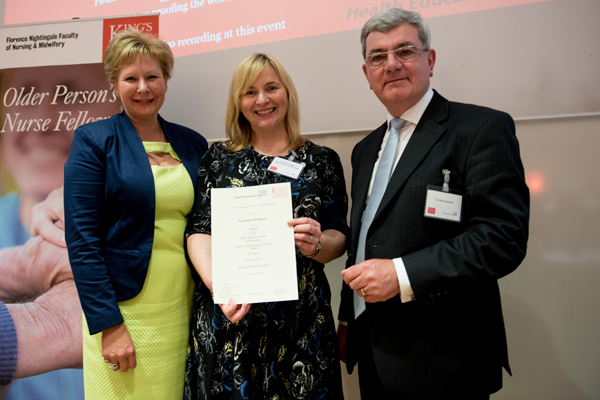 Nurse consultant for frailty and long-term conditions at North East London NHS Foundation Trust Geraldine Rodgers was awarded the £20,000 prize for best project. She won praise for helping create outdoor-themed rooms on an older person’s mental health ward which led to a dramatic reduction in incidents of violence and aggression by patients. In January, a total of 37 nurses were hand-picked for the second nurse fellowship course and will receive 60 academic credits and a postgraduate certificate in advanced practice upon its completion. Director of nursing at HEE Lisa Bayliss-Pratt was delighted when her organisation’s chair Sir Keith Pearson confirmed it will also fund the 2017 cohort. She paid tribute to the ‘groundbreaking work done to reach out across health and social care settings’ and urged nurses involved to ‘bang on about how great this programme is’. Senior lecturer Caroline Nicholson acknowledged ‘funding can’t continue at this level’, but urged nurses to ‘think outside the box, become entrepreneurs, and explore new ways of working’.